I love to write, to create stories that entertain, that provide an escape, that touch readers and possibly make them think or reassess or rediscover. I love to create characters that become friends, to whom readers can relate, characters that make you care about what happens to them and who linger with you long after you put the book down. My latest novel, What Remains True (Dec.1, 2017, Lake Union) is a story of domestic suspense. I'm honored that it was chosen for the Kindle First program for November and is already a bestseller! My next novel, All That's Left of Me will be released in June of 2018. I also have three humorous women’s fiction novels available; Something New and Sweet Nothings which were published by Penguin USA, and Say Never, which was chosen by Chick Lit Central as one of the best books of the year. The first book in my Musical Murder Mystery series, Murder in A-Minor, received honors from Readers' Favorite Book Awards and was featured on ABC, CBS, NBC, Fox, The Miami Herald, The Boston Globe and the LA Daily News. I am a workshop leader at the Southern California Writers Conference, the conference which truly set the path for my career and has since become my second home and family. I've also taught at the Writers Digest Novel Writing Conference, and the Santa Barbara Writers Conference. 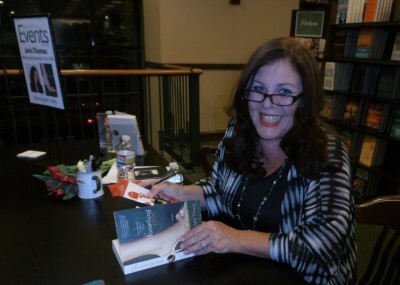 I have spoken at SCWA, RWA, OC Sisters in Crime, and was the keynote speaker at SCWC. This year, my partner in crime, Ara Grigorian, and I launched the Official Novel Intensive, a powerful and comprehensive one-day seminar for aspiring novelists. Nothing in my career gives me greater satisfaction than to provide valuable information and support to new authors. I have written over fifty songs, which I performed with my sister and our band she said when I lived in New York. I also wrote two children's books with my dad, Lenerd, about a two-headed dragon named Puff-Puffer. When I'm not writing or fulfilling my PTA duties, I like to play tennis, which is something I did as a kid and which I've taken up again these past few years. I like to think I'm sixteen when I'm on the court, but my aging joints often protest. I love to sing with my sister Sharilyn--we have something we call a genetic blend that's pretty cool. I'm a foodie and my husband is a former chef, so we often throw lavish dinner parties with outrageous menus for friends and loved ones. Some of our more exciting courses include uni (sea urchin) pasta, oyster shooters and filet mignon tartare with seared fois gras. I'm blessed with two insanely bright and all-around awesome kids who constantly challenge and inspire me, make me laugh and compel me to be the best mom I can be, although I occasionally question my parenting skills! I have an amazing husband who is my perfect co-captain for this crazy journey called life. He is funny, supportive, understands my morning need for 'coffee-before-conversation.' Plus he can cook like the dickens! I am honored to have incredible friends who love me and are always, always there for me no matter what, and help me to laugh at myself when I need to. I lost my mom a couple of years ago. She was an extraordinary woman, anyone who knew her will tell you. She was my first phone call in the morning and my last phone call at night, with twelve calls in between, even if we saw each other that day, which we did most of the time. She was my greatest champion, and continues to champion me, I feel her love and support every day. I lost my dad this past year, and like my mom, he was another great champion of me and my work. He was one of the most creative people I know--a true Renaissance Man, who painted, sculpted, and wrote scripts. I was blessed to have both of my parents for as long as I did, but I miss them both terribly. I am fortunate to live near to my sisters, brothers, aunts, nieces, nephews, cousins and close friends. I also have two crazy, wonderful dogs who teach me about unconditional love on a daily basis.